Terry is a copy-side Creative Director with nearly two decades of experience producing highly persuasive advertising communications of all kinds. 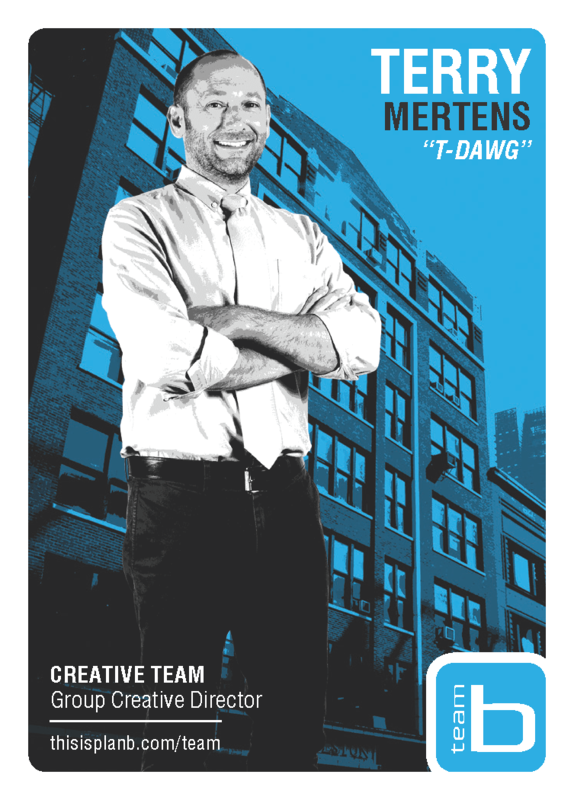 A highly versatile generalist, strategic thinker and exceptional writer, Terry leads the creative department at Plan B in producing award-winning work for a growing roster of 20+ clients. From integrated advertising campaigns to brand development to direct and CRM marketing programs, Terry provides global oversight of all department functions, ensuring the work is exceptional, on strategy, on time, and within budget. He thoughtfully manages an ensemble of creative talent, including creative directors, art directors, and copywriters, toward meeting a wide variety of client objectives. Prior to joining Plan B in 2009, Terry was Creative Director at Synchronus, a full-service marketing firm in Oak Brook, and Creative Director at tenthirty Advertising, an advertising boutique in Chicago’s West Loop. At tenthirty he developed and directed the agency’s creative process, serving clients including Allstate Insurance, Visa International, Wells Fargo, MBNA, and others. Other client accounts have included Harrah’s Entertainment, Jaguar Land Rover North America, McLaren Automotive, Gerber Collision & Glass, Oakwood Worldwide, Volvo Cars North America, PaperMate, and Azteca Foods. Terry lives in the Bucktown neighborhood of Chicago with his wife, two sons, and two dogs. He’s also the author of several unfinished books he intends to publish “someday” and a singer-songwriter with a self-produced CD of hopelessly marginal originals. Go ahead, look him up on iTunes.